I recently bought a puppy from Jeff. I’ve recently had my dog at Von Miler Kennels for obedience training. She was a good dog but a handful. After a month with Jeff she is completely different. I was coming over twice a week to work with Raven under Jeff’s eye, getting pointers on how to react and understand dogs behavior. He really knows what he’s doing. He knows how to get them involved in all activities to the point when dogs are eager to perform all requested tasks. You can tell right away that dog’s health and well being are priorities here. I recommend Jeff to everyone that has problems with their four legged friend! If you are looking for a top German Shepherd or Doberman he breeds the best I have two dogs from him his kennels are spotless and he takes care of the dogs like they’re his kids . And if you’re looking for protection dog he trains the best dogs for the work or a Family companion and I highly recommend him. I reached out to Jeff for a Dutch Shepherd. After lots of phone conversations, a few meetings at his kennel, I got the exact dog I wanted, and I mean exact – from temperament to color I couldn’t have asked for more. Jeff was extremely particular and brutally honest throughout the entire process. It may seem like overkill, but Jeff is not only looking out for you, but more importantly being a responsible and reliable breeder. Hands down reach out to Jeff! There is no other person I would trust more to handle my dog then Jeff. I got Brutus, beautiful, healthy, red doberman puppy as birthday present. It was 8 years ago. Brutus developed to be the most handsome, slim, muscular, top of the line doberman. Together with Brutus my relationship with Jeff was growing as well, with training, handling, or just casual boarding. Jeff was and always is the first and best source of information and advice, from handling to health, and it is always for the best benefit of Brutus. I would never buy any dog from any other place, or will never entrust anyone else more then I entrust Jeff. He is the most dedicated and knowledgeable person when it comes to dogs. Jeff’s knowledge about these dogs can be intimidating, but the passion he puts forth to bringing the finest examples is very inspiring. My wife & I spent a Saturday afternoon visiting Von Miller Kennels, and we were immediately impressed. You cannot help but feel that each canine represents the accumulation of his life’s work. To know that some of his past litters have gone to fill professional capacities, and IPO competition is definitely great. But more than that, and with Jeff’s guidance, we’re so looking forward to bringing home a new family member. In a word….meticulous!!! A picture is worth a 1000 words…just look at his facility pictures as it captures how he runs his business. I became close to Jeff as we got our puppy from him about a year ago. The facility depicts every phase of his operation..just super impressed how he is with all phases of his business. I cannot recommend anyone higher than Jeff…he is truly top shelf! Jeff is fabulous with training! Jeff is fabulous with training! He has trained two of my chowchow and did a great job in a short period of time. He continues to be supportive with great advice and compassion to a fellow dog lover. If you are looking for someone to train your dog no matter what breed or age he is fantastic and hands on with support. He also has gorgeous German Shepard puppies! You will not be disappointed with his training. When we got our Shitzu bichon puppy from a breeder, we were worried where she would go when we were out of town. The breeder highly recommended Jeff Miller. Our dog, Bella has been staying over at Jeff’s for 8 years. We never worry when we drop Bella off at Jeff’s. He treats her like his own dog. We highly recommend Jeff Miller for boarding!!!!!!! Have not gotten a puppy from Jeff yet but do plan on a future one. Have been working on training my dog with Jeff and he is always very patient and fair with the dogs which is so important. Very knowledgeable on all methods. Recommend! I searched literally throughout the U.S. (and yes, even some European sites!) hoping to find a special dog. I lost my (very) beloved service dog quite suddenly over a month ago and his passing left me and my remaining dog devastated. I was looking for a dog that could be a companion for my remaining dog who has some serious confidence and fear aggression behaviors. She is not a dog who is ‘dog friendly’ either. This dog had to also learn to be my service dog as well. The dog I lost was that once-in-a-lifetime dog! My best friend, my great protector, confidante, his loss shattered my heart so I didn’t want to just get a dog, I wanted to get THEE dog. I came upon Jeffrey’s website and saw a dog who immediately got my attention with his beauty and that something special spark in his eyes. I arranged to meet with Jeffrey and the dog a couple of days later and found the facilities very clean with expertly laid out equipment and devices for the training dogs in quite a variety of skill sets. He explained to me his philosophy of matching the right dog to the person(s), not just letting them select any dog by say looks. They get the RIGHT dog for them. I then got to meet the dog that I was interested in and WOW! This dog was something special! The dog was an adult, already very well behaved, energetic, enthusiastic and very social (and, to my delight, very affectionate!). Clearly he was very healthy and clean too. I fell in love with the dog almost immediately! I couldn’t just buy him though because of my King Shepherd back home. 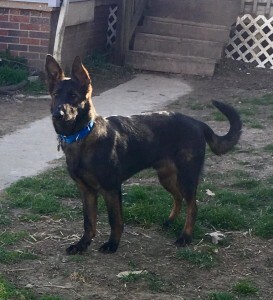 She is a tough cookie who doesn’t really seek out other dogs for play or socialization. She had to love him too! Jeffrey suggested bringing her with me the next day and let’s see how she is with him. I admit, I was extremely nervous about it. She is 114lbs, very muscular and VERY stubborn in her ways. Jeffrey was phenomenal! He initially took my girl and spent a little time alone with her, that alone I never thought she would allow anyone to do with her. Within a half an hour, to my astonishment, she was allowing Jeffrey to pet her. OK, even if I can’t get the dog I want, she is coming back for training herself! We introduced the dogs via a short walk, then putting them in a large fenced pen. They got along! The dog that I had hoped could join my family, the dog that worked his magic on me, was now working his magic on her! She didn’t play with him, but she had no aggression at all towards him! This new dog had that something special I had searched so hard for. He is so adaptive, so intelligent, so willing! He was THEE dog! To my delight, Jeffrey thought so too. I have had my new boy for almost a week now and he has been amazing in all respects. He is eager to do anything you ask of him, he learns incredibly fast and, to my personal delight, he is so affectionate and sweet! I absolutely love him and am so glad I found him! 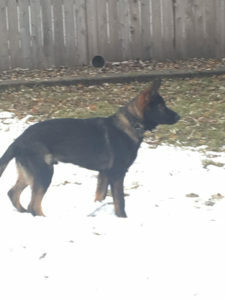 Going forward, we will be starting training with both dogs in another week or so. 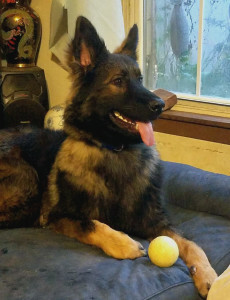 My King Shepherd will benefit greatly from Jeffrey’s skills and I am really looking forward to her being a more confident, happy dog for it. Nitris is such a sweet girl! We got her from Jeff at 5 years old and people always comment on how well-behaved she is. She is the perfect family dog- great with kids and loves to snuggle but also has a big voice when you need it. I’ve never had a Dobie before, but now it’s hard to imagine having any other kind of dog. Thank you, Jeff! This is Xaiser (born 05/30/2018) at 5 months old, as a first time dog owner I can say I was extremely lucky to find Jeffrey Miller via his website. What a great place to find the right dog, with someone as professional and knowledgeable as Jeff Miller….After searching for a long time to find the right pup/dog, I was near giving up, until coming across Von Miller Kennels. 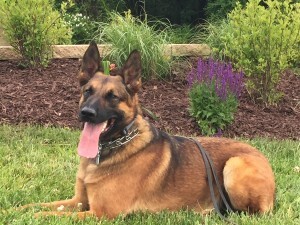 Where to start…When it comes to finding a German Shepherd, there is absolutely no where else that comes even close to the German Shepherds you get at Von Millers ( Iv tried about every other breeder & kennel you can find in the area ) . First, the dogs are phenomenal. They’re beautiful, healthy, well trained / obedient , and have a proven history of having great temperaments ( the MOST important along with health). And besides all this, Jeff Miller is there in every stage to offer his valuable expertise and advice. 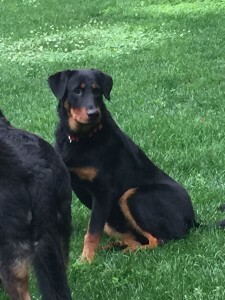 As a first time dog owner, Jeff gave me the honest run down and what it takes to own a dog, what to expect, what you NEED to know before making such a decision, I had to explain to Jeff how and why I was ready for a dog before he agreed to give me a pup, he is not your typical breeder who is hunting you down to make a sale. This means a lot. From even the time before I got Xaiser, to my first few months, to today, I can ask Jeff any question, or for advice and guidance about Xaiser and he is more than willing to answer them and help me out. This shows me I got my pup from someone who sincerely cares about Xaiser and I. In conclusion, I could not have made a better decision, thanks Jeff and keep up the wonderful work you do! Name What is your name to display? Dog(s) Name What is your dog's name? Dog Photo Please add you furry friend to the collection! Rating How would you rate your experience? 5 Stars = 100% satisfaction and I will tell my friends!